Search results for "rare is everywhere"
What makes us as humans (and animals) unique? Our genes! Rare Is Everywhere shows us that there are rare species everywhere around us, celebrating their uniqueness and helping children who suffer from rare diseases know that they are not alone. 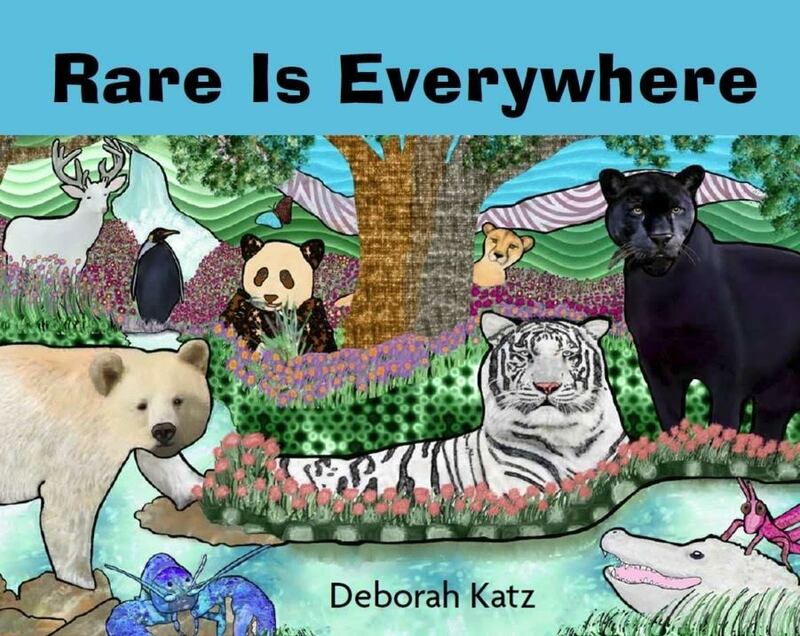 Rare Is Everywhere takes readers on a tour of the animal kingdom, revealing that animals can be very different from the norm. Grasshoppers can be pink, tigers can be white and lobsters can be blue, who knew?! The book showcases eleven animals in vibrant illustrations and poetry to help children recognize and accept diversity in themselves and in others. Each page features a rare animal alongside its everyday counterpart. The text reveals both their shared traits and their differences. The glossary provides more information about each animal and the genetic changes that shape their appearance. Changes in genes are responsible for most of the 7,000 rare diseases known today that affect millions of people, the majority of whom are children. Most of these conditions are overlooked and underfunded. Proceeds from the sale of this book will be donated to the Rare Disease Foundation, an international organization that helps people, especially children, with rare diseases. While we always teach our children being different is beautiful, sometimes it can be hard for children to understand that their uniqueness is what makes them special. Especially when all they want to do is fit in. It makes it even more difficult when a child is affected by a rare disease. They are trying to navigate their way in school, extra curricular activities and social skills, all while living and treating a rare disease. I loved how this book shows how special each unique trait and difference is. Being different is special for so many reasons and this book brings this to the forefront. Take for example the albino deer, while it may be hard for the deer in the summer, in the winter this deer has an advantage over its peers because of its colouring. This is what the book explores – that yes they may be different but this difference gives them an advantage and makes them special. I learned quite a bit from this book – I never knew about blue lobsters or pink grasshoppers before! It definitely had us talking as a family about how these changes make us special and deserve to be celebrated. The illustrations of this book are child friendly with bold lines and bright colours. The writing is perfect for children, easy to read out loud and for children to read along with. The book also includes a page of jokes that we fell in love with, they were really well done and fit in perfectly with the book. This is a lovely book for all children to read to help celebrate and appreciate differences and all that makes us unique. Even more special, is that proceeds from this book will go to the Rare Disease Foundation. You can learn more about the book here. 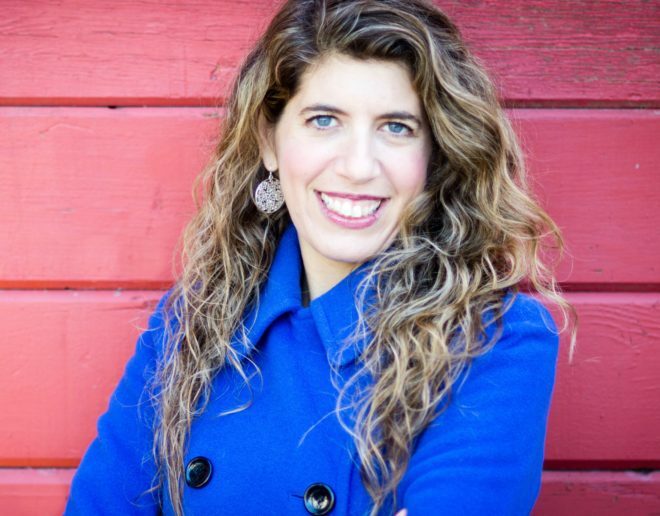 Deborah Katz is a Vancouver, BC, nursing professor with nearly twenty years of experience in health care. She is also a writer and an artist whose work has appeared in local galleries and various publications. Before becoming a nurse, Deborah studied wildlife biology and loved learning about the diversity of the animal species and how genetic changes can make them stand out in ways that are beautiful and breathtaking. The Rare Disease Foundation (RDF) supports people who have been diagnosed with a rare disease. Their mission is to create communities of patients, caregivers, health care providers, researchers and supports that work together to transform the lives of those living with these diseases. A rare disease is defined as a condition that affects fewer than one in 2,000 people. There are more than 7,000 known rare diseases in the world and many more that have not been classified. About one in twelve people, nearly 3 million Canadians have a rare disease. Most rare disorders are severe and chronic, with many being life threatening. The RDF was started in 2007 by a group of parents and doctors in Vancouver BC as a means of finding answers for patients with rare and undiagnosed diseases. In 2008, the RDF became a non profit organization and developed a cross-disease support network for the rare disease community. The RDF has been able to complement their innovative research approach with inclusive social support. When we think of miracles, we sometimes think of incredible, unexplainable incidents that have happened. While this is definitely one version of a miracle, everyday we are witness to many little smaller miracles that help to make this world a better place. We just sometimes tend to pass them by without second glance. I think of my own life and how my life has been touched by strangers, and it makes it easy for me to believe in daily miracles. I still remember receiving a phone call at the gym that my childhood dog had passed away and I broke down crying on the machine. I couldn’t function to even walk away from the machine; all I could do was cry and try to hide my tears from others. One woman, whom I did not know, came up to me with a box of Kleenex and gave me a squeeze on the arm before walking away. At that moment, her act of compassion gave me the strength I needed. Another time, after my car accident three years ago, I had an incredibly difficult time forgiving myself for spinning out on the ice and damaging the car. It became so bad that I could not function with daily tasks at home and at work. I was angry, frustrated and depressed. When I went to Church one Sunday morning and sat down in the pews, there were olive leaves placed by the song books. I don’t know who had left them (there were no olive leaves anywhere else in the Church), nor why they chose that spot, but that was a sign to me that God forgave me and that I needed to forgive myself. I still carry that branch (with much fewer leaves on it) in my new car to this day, as a reminder to forgive not only others but myself. 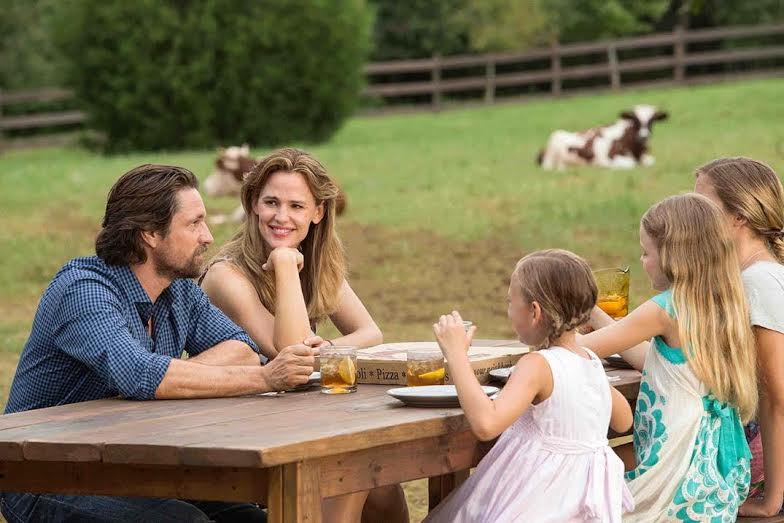 In Miracles from Heaven we witness Anna, a young and active girl, who one day becomes very unwell. Her parents take her to multiple doctors who give a variety of medical opinions, none of which turn out to be correct. Her parents hit their final straw while in the emergency department again and demand the doctors rerun tests. It is then that they discover she has a rare disorder that causes her not be able to digest food properly. Her life and the life of her family is turned upside down as they struggle to understand and treat her disease while travelling back and forth from specialists and managing daily life. We learn how serious this disease really is and the possibility of Anna dying is very real. My children are my greatest miracles. They are a gift from God to me and I still remember the day they came into this world. I remember the moment they were placed in my arms, wet and screaming and how utterly amazing they were in that moment. After suffering through six miscarriages, I knew how precious life was. 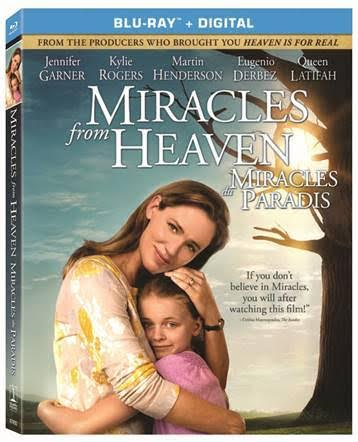 While watching Miracles From Heaven, all I could think about was my own children and how painful this must have been for their family (the movie is actually based on the true story and memoir of Christy Beam: Miracles from Heave: A Little Girl, Her Journey to Heaven and Her Amazing Story of Healing) and how frustrated and angry they must have been. We watch as Christy struggles with her faith in God and her faith in others as she tries her best to do anything to keep her child alive. I know so many parents can relate to this as we would do anything for our children regardless of the cost. We watch as the family struggles to keep their faith alive while facing the realities of the disease and the possibility of Anna’s death. Anna’s Father desperately tries to hold the family together so that Christy can be with Anna in another State for treatment. In those moments of despair in the movie, I loved how an act of kindness would emerge. We don’t always see the full act of kindness until the last scene, but there were so many people who helped lift the family up, carry them in their worst moments and give them hope. From the random kindness of a waitress who offered a personal tour of the city to Anna and Christy, to the receptionist who broke protocol and helped Christy, these moments make this movie that much greater. We are not individuals living separate lives, we are all connected by love and hope. These scenes helped to drive this home for us. It is also helped our family to appreciate how many times our own lives have been unknowingly touched by strangers and we have been left better for it. 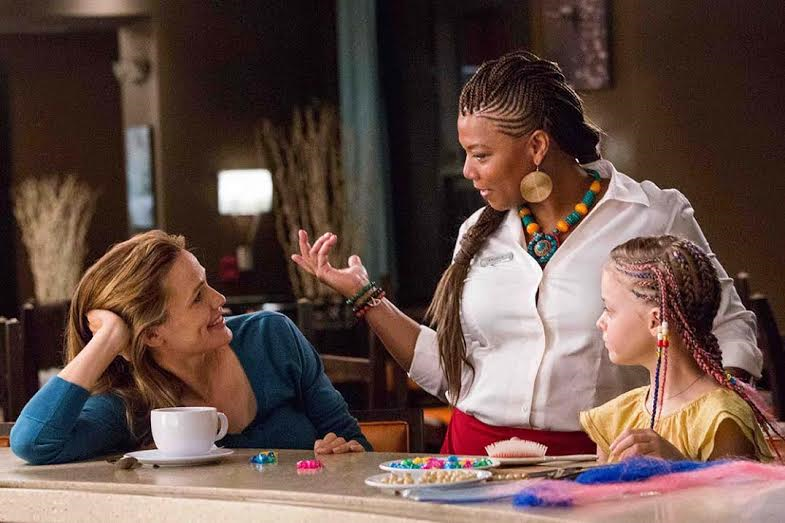 Miracles from Heaven has a stellar cast including my personal favourite actors; Jennifer Garner and Queen Latifah. Jennifer Garner plays Anna’s Mom perfectly. We could feel her pain, her love, her hope and her despair through the screen. You felt as though you were Anna’s Mom. You cried and laughed along with her and you felt each emotion deeply (be prepared with the box of tissues beforehand!). You want to hold Christy and tell her it will be okay and offer her your help. On the flip side, we have Queen Latifah who offers up her unique ability to make you laugh and smile in the hardest moments. Her character comes in at a dark point for Anna’s Mom and helps her believe again. She becomes an incredibly important person in Anna’s life and it all started in a small restaurant with the kindness of Queen Latifah’s character, as she waited on tables. 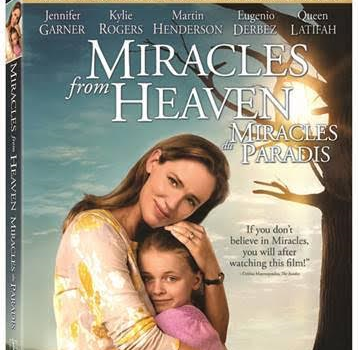 Miracles from Heaven is an incredible, inspiring movie of faith, hope, family, and how everyday little miracles make the world a better place. You will cry, you will laugh, but you will also finish the movie feeling inspired and hopeful. It is a movie that you can enjoy as a family, or even appreciate once the children go to bed. For me, it reminded me of how blessed we are as individuals and as a family, to never take this for granted, and to always help others. Our actions, while they may seem small, may be the greatest gift we can give another person. For more information on Miracles from Heaven, you can check out the website, or follow them on Facebook.